The gas density, for high-voltage switchgear, is a critical operating parameter. If the requiredgas density is not present, safe operation of the switchgear cannot be guaranteed. The gas density measuring instruments from WIKA warn reliably against dangerously low gas quantities, even under extreme environmental conditions. Electrical switch contacts warn the switchgear operator if the gas density, on account of a leak, drops below a specified value. The WIKA gas density monitor is hermetically sealed and temperature compensated. Measured value fluctuations and erroneous alarms caused by changes in either ambient temperature or air pressure are therefore prevented. With regard to switchgear safety, asset protection and environmental protection, it is common to perform functional checks on a regular basis. Article 5 of the EU regulation on fluorinated greenhouse gases provides for checking of the leakage detection system at least every 6 years if it contains > 22 kg SF₆ gas and the plant was installed after 01 January 2017. 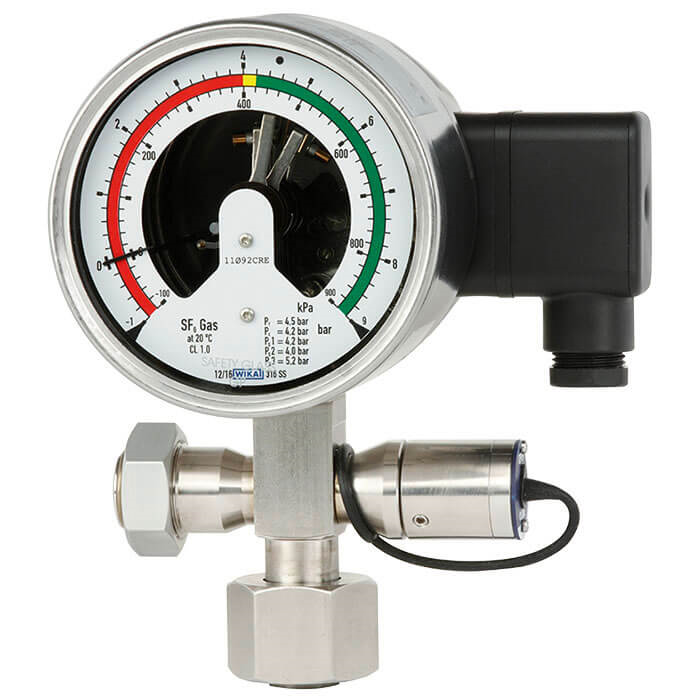 With the help of the firmly welded calibration valve, the gas density monitor can be shut off from the process and recalibrated without having to disassemble it. This not only reduces maintenance time but also minimises the risks of SF₆ gas emissions and potential leakages during recommissioning. In order to prevent unintended opening or closing of the shut-off valve, the latter can only be operated using a special tool and a torque spanner. When the shut-off valve is closed, the special tool cannot be removed. The special tool can be removed only after the shut-off valve is opened and the gas density monitor is thus again connected with the switchgear.